Welcome to our apartment in Puerto de la Duquesa, one of the best kept secrets in the Costa del Sol. We would like you to see pictures of our apartment and read about the area before you decide to rent it. 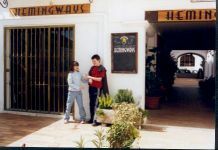 La Duquesa is well situated on the road network, 10km south west of Estepona on the N340 highway. There are plenty of beautiful places to visit in Andalucia. Granada is about 2 hours drive away and Seville 2.5 hours. Click here for more information on the area or here for travel information including flights and car hire or here for golf specific information. There are two bedrooms, one double and one twin, two bathrooms, one with a bath and one with a shower. The kitchen is fully kitted out including a dishwasher and microwave. It has its own breakfast area off to the side and a separate laundry with a washing machine and iron. The large sitting/dining room has a satellite television with BBC stations, a video, radio and CD player. The apartment is fully air-conditioned. It is on the first floor with views from the balcony to the blue flag sandy beach, the swimming pools and the gardens. This brand new front line complex has four pools altogether set in beautiful tropical gardens. There is a lift for easy access and a designated secure parking space beneath the block. For the latest availability please click here. The Marina de la Duquesa complex is in a quiet area on the seafront yet it is only a minute from the marina and port area of Puerto de la Duquesa. There you will find numerous shops and bars and a bank with an ATM. Restaurant include cuisine from France, Italy, Thailand, China, India, Great Britain and Ireland as well as Spain. It is about one hour's drive from Malaga airport and 30 minutes from Gibraltar. The marina has more than 300 berths. There are no high rise hotels here to spoil the view. The blue flag beach stretches as far as Sabanillas and on to Estepona. On the other side, it winds around the coast to Sotogrande. The waterfront is closed to traffic making it very safe for children. In the summer there is a street market. Sabanillas is a nearby seaside resort with a more Spanish feel. There are many shops including pharmacies, a tabac where you can buy stamps, supermarkets, an English bookshop and furniture shops if you feel so inclined. There is also a market on Sundays. Duquesa's golf and country club is a championship 18 hole Robert Trent Jones course. It is 400m away and overlooks the Mediterranean with views out to North Africa and Gibraltar. There are plenty of other top quality courses within a 30 minute drive of La Duquesa. Costa del Sol is sometimes referred to as the Costa del Golf. For a partial list and more information please click here.